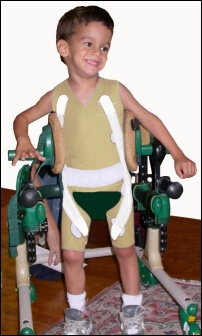 How can TheraTogs help in the management of ADCP (Athetoid/Dyskinetic Cerebral Palsy)? The presence of continuous, uncontrolled movements interferes with the acquisition and maintenance of postural control and with effective limb use. Because postural control – the ability to sustain a posture while attending to and engaged in a purposeful activity – is the foundation of movement acquisition, we recommend beginning to use TheraTogs garments to support the acquisition of the fundamental, core components of trunk and pelvic alignment and control in all positions while enhancing body awareness and somatosensory input. Dyskinetic cerebral palsy, an extrapyramidal subtype that features involuntary movements and fluctuations in muscle tone, includes two subgroups: athetosis and dystonia. Athetoid dyskinetic cerebral palsy (ADCP) occurs in approximately 15% of the CP population. Affected individuals show difficulty in maintaining postures and balance when sitting, standing, and walking. Undesired movements interfere with purposeful, selective muscle use, worsen with stress or excitement, and cease during sleep. 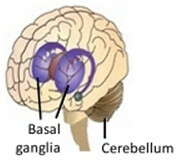 ADCP is primarily associated with damage to the basal ganglia occurring during brain development. Reeves, Alexander G. and Swenson, Rand S. Disorders of the Nervous System: A Primer. Dartmouth Medical School online library. Rosenbaum P, Paneth N, Leviton A. 2007. A report: the definition and classification of cerebral palsy April 2006. Devel Med Child Neurol. 49(Supp s109): 8. Himmelmann K1, Hagberg G, Beckung E, Hagberg B, Uvebrant P. 2005. The changing panorama of cerebral palsy in Sweden. IX. Prevalence and origin in the birth-year period 1995-1998. Acta Paediatr. 94(3): 287.